Our records show you purchased or received the Folding Camp Rocker (0HGC3, 257464) sold by L.L.Bean between April 3, 2009 and July 16, 2010. In cooperation with US Consumer Product Safety Commission, the manufacturer, Mac Sports, is recalling the Folding Camp Rocker because the plastic anchors used to support the back of the chair may break while in use, posing a fall hazard. Please examine the anchors on the back of your rocker to determine if your rocker has plastic anchors and is subject to this recall. 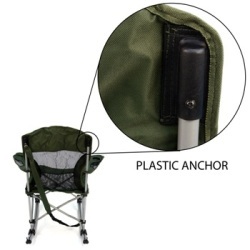 If your rocker has plastic anchors supporting the back of the chair, please immediately stop using your Folding Camp Rocker. Please note that Mac Sports has changed the anchor material from plastic to fabric in the current production. If your rocker is subject to this recall, we request you return only the plastic anchor not the entire chair. Please see the safety recall instructions below to return the plastic anchor. You will receive an exchange rocker with fabric anchors. Due to manufacturing considerations we ask you to allow a minimum of six weeks for delivery of your replacement rocker. As always, our 100% Satisfaction Guarantee applies if this option is not acceptable or if you are not satisfied with this product for any reason. If you prefer, you may return the rocker to us for your choice of a full refund, a credit to your credit card, or a gift card. Remove the screw on the back of the upper portion of the backrest. Slide the plastic anchor off of the steel support arm. Cut the fabric around the plastic anchor and remove this piece. Slide the plastic anchor off the steel support and place it in a mailer. Click the Print a Prepaid Recall Label button at your right and follow the instructions on the next page. Please be sure to indicate whether you would like a refund or a replacement. If you opt to have your item replaced, specify whether you would like a red or a green chair. Once you complete the form on the next page, follow the instructions to print the form and prepaid label. Include the form with your recall and attach the label to the package. Drop the package in any convenient USPS postal box or at any UPS location. PLEASE SAFELY DISPOSE OF THE REMAINDER OF THE RECALLED FOLDING CAMP ROCKER. FABRIC ANCHOR IS NOT INVOLVED IN THIS RECALL. If you do not have access to a printer and you have the affected product, please call L.L.Bean, Inc. at 800-555-9717 for return packaging and mailing instructions. If you prefer, you may use any convenient packaging and ship the plastic anchor to the address below. Please be sure to indicate whether you would like a refund or a replacement. If you opt to have your item replaced, specify whether you would like a red or a green chair.